I must have been living under a rock for awhile, because I hadn’t heard of smoothie bowls until last month. 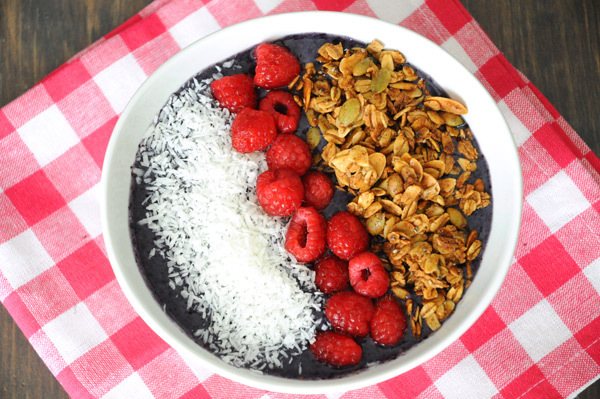 What is a smoothie bowl, you ask? Simple: a smoothie – in a bowl (made a bit thicker). Yes, I’m serious. Yes, it’s way more fun than it sounds. Yes, it’s just as tasty in a bowl as it would be in a glass. This was my first every smoothie bowl that I made last week. It’s just frozen blueberries, a large banana, some ground flax seed and a bit of almond milk, topped with homemade granola, coconut and fresh raspberries. It did not disappoint. I love that I can add all kinds of toppings, which you can’t really do with a “regular” smoothie (drinking shredded coconut and granola would probably not work very well)! Now, what can I make next? 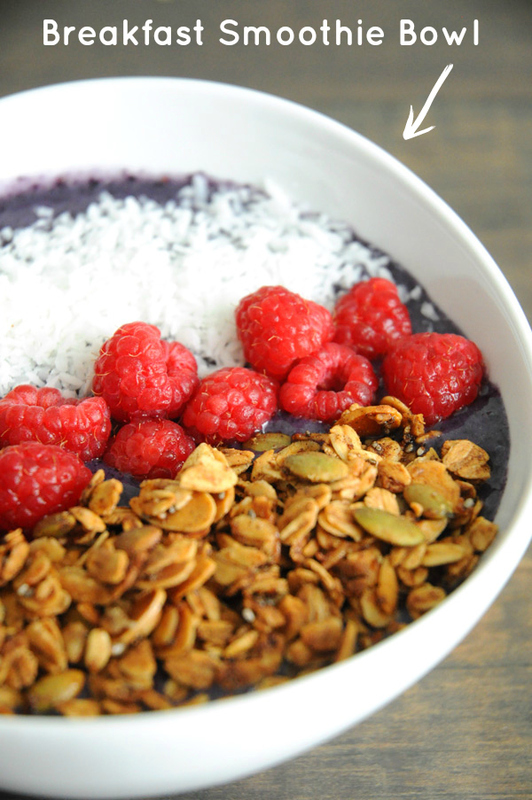 If you’ve made smoothie bowls before, what do you like putting in yours? Add all ingredients (except toppings) to your blender, and blend until smooth & creamy. You want it to be a bit thicker than a traditional smoothie that you would drink. If the mixture is too thin, add another ½-1 banana or more berries. Scoop mixture into your bowl and top with your toppings of choice. Eat with a spoon! What a fabulous idea! I love smoothies but find they don’t fill me up by themselves. 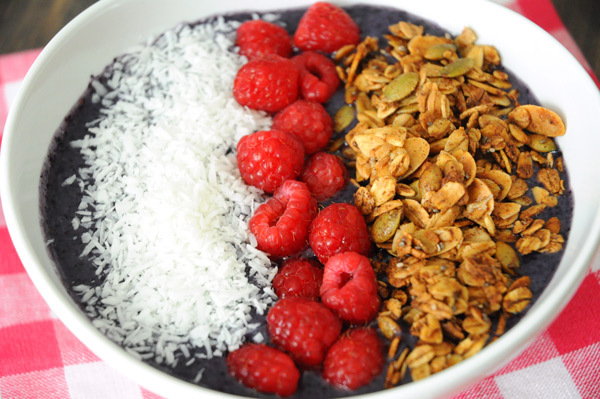 Adding some granola and berries and making this more of a “Bowl” is an awesome idea! I can’t wait to try it! Thanks! Hi Cassie! Would you mind if I used your smoothie bowl in a round-up post I am running on my blog? It’s gorgeous! I wanted to ask permission before using your image and linking back to your website.